CINCINNATI -- High school coaches typically put in a ton of hours during the season. Adding a weekly road trip to the schedule is a bit much, but that’s what Elder football coach Doug Ramsey has done this year. He’s hit the road each Saturday to take in his son Peyton’s game with Indiana University. And a little scary at times. Peyton, a red-shirt freshman quarterback, has played in every game. He took over as starter four weeks ago. The first game was against Charleston. The next two were against Michigan and Michigan State, two ranked teams with ferocious defenses. Peyton and Doug Ramsey on signing day. That part of it is harder on Ramsey’s wife, Cherie. When ABC focused on the Ramsey family during the Michigan State game, Cherie wore the expression of a concerned mother. The Ramseys have made six of Indiana’s seven games. Elder played St. Ignatius on the same Saturday that IU played Georgia Southern. That means hitting the road at 6 or 7 a.m. Saturday after a Friday night game. Bloomington’s about a three-hour trek. The road games at Virginia, Penn State and Michigan State meant really long days. Peyton played for Doug at Elder, but this is different for him. “When he was playing for me, you’re not watching for your kid,” Ramsey said. “You’re coaching the game. You’re always thinking about what the next play is. You’re thinking about every other thing. 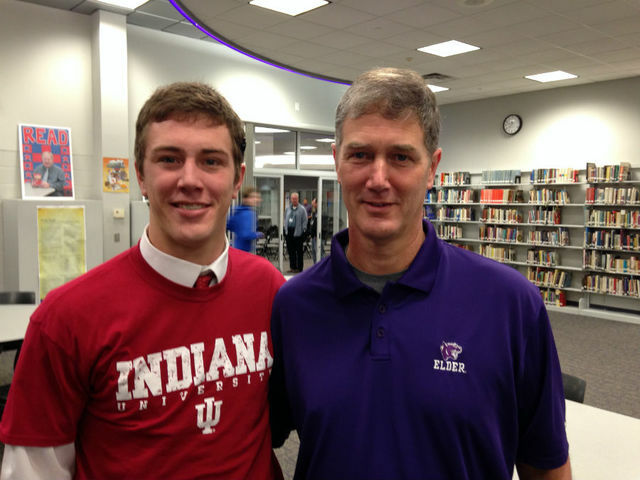 Peyton holds most of the school passing records at Elder. He completed 570 of 900 passes for 6,708 yards and 49 touchdowns. He ran for 2,692 yards and 32 TDs on 465 carries. He led Elder to the playoffs in each of his three years as a starter, making the regional finals as a senior. He was rated as the 44th best quarterback nationally his senior year. Miami University recruited him heavily. Cincinnati made an offer, although Doug said he wasn’t sure if it was a “real” offer. “Tommy Tuberville never spoke to Peyton,” Doug said. Peyton redshirted last year, but he made an impression on the program at Indiana. He was named scout player of the week five times. After a strong spring game, first-year coach Tom Allen said Ramsey would get playing time. Ramsey started the year as the backup to senior Richard Lagow. But Ramsey played in every game. He was brilliant in leading a road win against Virginia, completing 16-of-20 for 172 yards and two touchdowns. He wasn’t named the starter until the Charleston Southern game, partly out of necessity. The Indiana offensive line has been hit by injuries. Ramsey, at 6-foot-2, 210 pounds, is much more mobile than Lagow. But Ramsey had to be more than just athletic to take over for a senior. "There's a grit to him,” Allen told reporters when he announced the move. “There's a toughness to him that he's got a linebacker mentality in how he works and how he handles adversity and all that. I've noticed that since he's been here. So those are the kind of things that I always saw that he had in him. That's what leaders do." The Hoosiers rolled in the Charleston game. They’ve lost to Michigan and Michigan State the last two weeks. But Ramsey acquitted himself well. IU took Michigan to overtime and led MSU in the fourth quarter. Ramsey is 103 for 164, 62.8 percent, for 973 yards and seven touchdowns against three interceptions. Those are respectable numbers considering the pressure he’s faced from the pass rush. He missed a couple of plays against Michigan. But he’s kept healthy otherwise -- well, relatively healthy. The Hoosiers go to Maryland next Saturday. The Ramseys will make the trip. They’re flying this time. It still figures to be a long, tiring, scary and, of course, fun day. John Fay is a freelance sports columnist; this column represents his opinion. Contact him at johnfayman@aol.com .